When can I walk on my carpet after cleaning? Are your cleaning and protection methods safe? How do I contact Complete Floor Care San Diego? Do you provide services beside carpet cleaning and flood repair? Is Complete Floor Care San Diego certified? What type of chemicals do you use? Are they safe? We are very proud of the fact that we use Planet Guard products, eco friendly and effective green cleaning products that don't have synthetic chemicals, allergens or dangerous toxins. Made with all-natural ingredients, our cleaning products are absolutely one of the safest used in our industry today. Learn more about our Green Cleaning. Keep pets, children and regular traffic off the carpet for a period of six hours. Adults may use the carpet lightly immediately after cleaning by wearing socks or house slippers. Some carpets may still feel slightly damp for up to 18 hours depending on the carpet fiber type and soiling condition. This is normal and will not cause any problems. We Can clean carpet or rugs over hardwood floors? 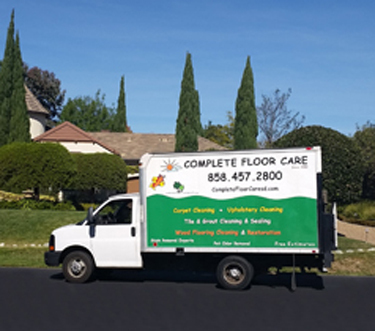 At Complete Floor Care of San Diego with the technology we use for cleaning and protection will not only provide you with the satisfaction of a clean floor, but also the knowledge that you are safe in your house. The chemicals we use do not leave residues that may cause irritation, nor are they harsh to your flooring. All of our master cleaners are certified. 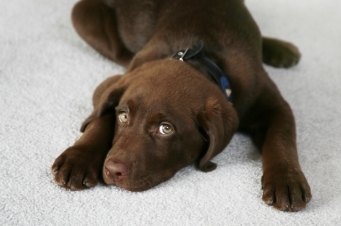 Pet odor in carpet is a common unfortunate incident. Though it seems like it may not be very harmful to your carpeting, it can actually be a complex problem, as the urine can soak through carpeting, and onto the floor and padding beneath. When left without resolve, the urine leakage provides a growing spot for bacteria, which creates a worse odor issue, and can permanently stain the carpet. The best way to rid yourself of this issue is to have the urine cleaned from each layer of the carpeting – from the top of the carpet itself, the padding, and the sub floor on the bottom. In light cases where the urine may only penetrate the top of the carpet, simple cleaning from us would be enough to remove the odor and the stain. However, in cases where there has been a large amounts, the carpet padding may need to be replaced and the sub floor and underside of the carpet will need to be treated and cleaned. Learn more about our Pet Odor Removal Services. That is the million dollar question, and the difference between a happy customer and a dissatisfied one. Of course, there are permanent stains that can never be removed and should be addressed by carpet cleaning professionals such as Complete Floor Care San Diego. Any type of artificially colored stains, and many others are nearly impossible to remove, but can be lightened. 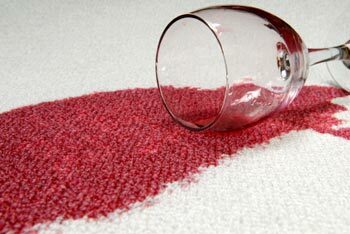 Stain kits are available to remove these stains but once again there are factors involved as far as longevity of the stain, volume and carpet color as well. How do I contact Complete Floor Care SD? 858-457-2800. Our professional staff is available to help you with any questions about our carpet and floor cleaning services. There are two ways to make an appointment: You could call us at 858-457-2800 Or use our easy contact form to schedule an appointment. You will receive an immediate response. We value your time as much as you do. Do you provide services beside carpet cleaning? Yes, our certified technicians are also proficient in upholstery, area rug, and hard surface flooring cleaning, including wood flooring, grout, ceramic tile and natural stone. Find out more in our Services page. Is Complete Floor Care SD certified? Complete Floor Care SD is a certified firm. The IICRC is the most recognized organization for certification of high quality carpet, rug, and upholstery cleaners. Our founder, Don Sargent, is an Certified Master Textile Cleaner, the highest level of certification granted. He hasbeen a carpet cleaner in San Diego for nearly 30 years. Our knowledgeable staff applies the most rigorous, up-to-date and eco-friendly standards to your carpet and floor cleaning needs. Our area of service is San Diego County. Find out more about the areas we serve in San Diego County, CA.